“Christopher McPherson, Development Director of Abstract Securities, said: “The letting to Sovereign underpins our confidence in Basingstoke as a business destination, with its excellent transport links, first class amenities and high-quality work force, and our decision to speculatively build here is wholly vindicated by this long term commitment to the Town by a major employer. This is a huge endorsement for Basingstoke. We have generated good tenant interest since the building completed, but Sovereign were nimble and decisive. A number of other potential occupiers will be disappointed’. Over the past 5 years Abstract has built over 1 million sq.ft. of net lettable offices across the UK, together with a major office refurbishment of 250,000 sq.ft. making it one of the country’s largest regional developers. The Group undertakes development as a principal speculatively and for end users. Abstract also acts as a development manager under design and build arrangements and in joint venture partnerships. More than 500 property industry professionals have now taken enough steps to walk three times around the world during October. They were taking part in Steptober, the first industry-wide step challenge sponsored by Abstract Securities. The event has now raised over £100,000 for LandAid, the property industry’s charity. Steptober challenged property professionals to walk, jog or run to see which team of four could log the most steps throughout October – improving mental and physical wellbeing whilst raising money to end youth homelessness. The challenge came to a close just in time for the annual LandAid Day on 1 November, property’s biggest day of fundraising, which saw property companies taking part in wacky and wonderful activities across the UK. The event culminated with a prize giving on LandAid Day, kindly hosted by CMS. Four coveted prizes were given out. Leach Rhodes Walker Architects Team CJG walked away with the Team with the Highest Step Count Award, logging a staggering 3,056,138 steps between them and holding the top spot since the off. They were closely followed by Leach Rhodes Walker Ltd Team JB and Northern Scam in second and third place, respectively. #4CEOs4Steptober, David Atkins of Hammerson, Chris Grigg of British Land, Robert Noel of Landsec and David Sleath of SEGRO, clearly won the Highest Team Fundraiser Award, sponsored by IPSX having raised over £45,000, enough to fund at least 3 beds spaces for young people who were homeless. Archie Blair, Abstract Securities won the Individual with the Highest Step Count Award taking 1,106,032 steps – an average of 35,000 steps a day. The North won the Location Outside of London with the Highest Step Count Award, sponsored by Gerald Eve. The challenge was made possible due to sponsorship from Abstract Securities, support from media and data partner EG, who promoted Steptober each week throughout October, and Prize Giving sponsor CMS. This year’s LandAid Day saw the property industry doing even more to raise money to end youth homelessness. Paragon BC, one of LandAid’s newest Foundation Partners, undertook a company-wide challenge to cycle the distance between Lands End to John O’Groats – a massive 874 miles! Goldcrest Land planned an inventive race across London, where teams vied to be the first to get from their offices in Fulham to Hoxton, using a different mode of transport each. A whole host of other companies, such as British Land, Knight Frank and PwC all took part in an assortment of unique activities throughout the day, raising even more to help end youth homelessness in the UK. LandAid is the property industry charity, working to end youth homelessness in the UK. We bring the property industry together to support charities delivering life-changing services for young people who are or have been homeless, or who are at risk of homelessness in the future. Through a unique network of corporate partners, we invest funding and expertise where we can achieve lasting impact. Mark Glatman's Abstract Securities has announced that its associate company, Abstract (Basingstoke) Limited, will complete The Florence Building, its ‘uncompromising value’ office scheme, on 23 July 2018. It will be the Town’s first new speculative offices in 15 years offering the lowest cost per work station in the South East of England. Furthermore, 203 under-cover car parking spaces, will provide the best car parking ratio of any new speculative Town Centre office building in the South East. A landmark development located in Basing View, Hampshire, The Florence Building comprises 60,535 sq.ft. of ‘Grade A’ space on ground and four upper floors. Notably, the building offers flexible, virtually column-free floorplates from approximately 9,200 sq.ft. to 12,400 sq.ft. 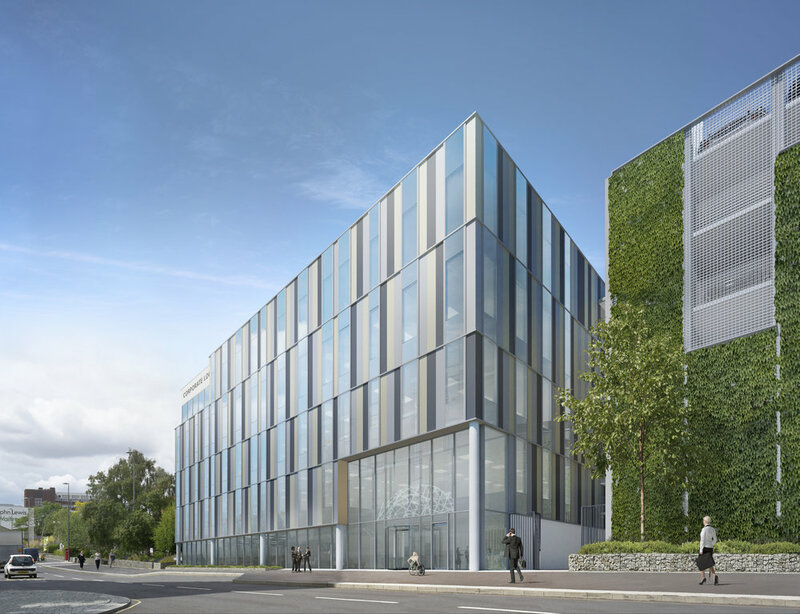 It is designed to a BREEAM 'Excellent' 2014 and an EPC 'A' rating to provide some of the most efficient and environmentally friendly office accommodation available. The interior will be finished to a full Cat A standard including air-conditioning, suspended metal ceilings, LED lighting and raised floors. A contemporary reception area will feature a double-height glazed atrium space, while lockers and shower facilities on the ground floor are adjacent to 48 secure covered cycle spaces. There is potential for up to 24 electric vehicle fast-charging points. It is the fourth in a series of Abstract’s “uncompromising value” speculative office developments and follows on the heels of successful developments in Gatwick, Croydon and Glasgow, where a similar methodology has been well received by the market. A prime business location, Basing View offers an unparalleled location to enhance profitability and work life balance. It benefits from Enterprise Zone status with a new £10m landscaped public realm and a dynamic mix of office, retail and leisure amenities for staff. Just eight minutes’ walk to the train station (42 minutes to London, Waterloo) and just five minutes’ walk to leisure amenities; a new proposed Village Hotel with gym, swimming pool, café and meeting/events space will soon join John Lewis Home and Waitrose. Basingstoke is a rapidly growing town and one of the most affluent in the UK, surrounded by exceptional countryside with access to a significant pool of talent and easy access to some of the most desirable residential addresses. The scheme is designed by TP Bennett and Bowmer & Kirkland is the contractor. Savills and RARE are jointly marketing The Florence Building. Visit http://www.theflorencebuilding.com/video/ and www.theflorencebuilding.com for further information on the development. For Abstract Securities visit www.abstractsecurities.com. The following comparison provides the 'cost per workstation' on additional selected towns. Based on an occupancy of 1:8m2 per person in the Florence Building is just £3,400 per annum when compared with £5,300 in Woking; £5,500 in Staines; £5,900 in Maidenhead; £7,600 in Hammersmith and £13,400 in London’s West End. Moreover, when occupied at the current design ratio of 1:8m2 per person, the building is more cost-effective than high-quality second-hand or refurbished office space in Basingstoke designed at 1:10m2 per person occupational density with costs coming in at £3,400 and £3,700 respectively. Future proofing of the building includes: diverse connectivity to high-speed communication networks including Virgin and BT Openreach with potential for WiredScore ‘Gold’ Certification; dual HV power supply resilience and standby generation; ability to increase occupational density to 1.6 sq.m., that will lower the cost per work station to £2,600. Abstract has gained a strong reputation for delivering award winning schemes, including its new range of “uncompromising value” offices. These buildings deliver high specification, ‘Grade A’ space with top environmental credentials (BREEAM Excellent and EPC ‘A’ rated) with a tight design and procurement process, offering occupiers the best value and cost per workstation of any modern offices in their local market. Mark Glatman's Abstract Securities has announced that its associate company, Abstract (Basingstoke) Limited, has unveiled a new fly-through video that provides a preview of The Florence Building its new ‘uncompromising value’ office building and showcases Basingstoke, a key business destination in the South East. The Florence Building is a new 60,000 sq.ft. office development and the first new speculative office building in the Town in 15 years. Comprising ground and four upper floors, the building has been designed to offer optimum, virtually column free floor plates from approximately 9,200 sq.ft. to 12,400 sq.ft. Due to complete on 23 July 2018, it will also include 203 under-cover car parking spaces. Mark Glatman, chief executive of Abstract said: “With works now well underway, we are proud to bring The Florence Building to the market at a time when we are seeing occupiers upgrade their accommodation to the highest specification to attract and retain the best staff. Our development offers 'uncompromising value' and is the first new-build office in the Town in 15 years. “This video gives a contemporary overview of Basingstoke as a business destination, and all that the Town has to offer, providing sweeping external and interior views to each of The Florence Building’s floor plates. A prime business location, Basing View offers an unparalleled location to enhance profitability and work life balance. It benefits from Enterprise Zone status with a new £10m landscaped public realm and a dynamic mix of office, retail and leisure amenities for staff. The site is just an eight minute walk to the station (train time - 42 minutes to London, Waterloo) and just a five minute walk to leisure amenities; a Village Hotels with gym, swimming pool, café and meeting/events space will soon join John Lewis Home and Waitrose. * Source: (Savills and Rare 2017). Visit www.theflorencebuilding.com for further information on the development and Abstract Securities.